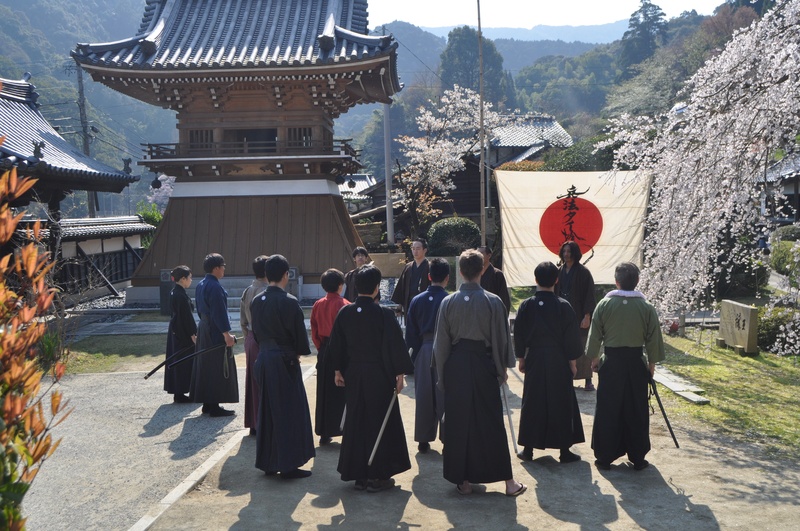 We are students of Tasiha-ryu Kenjutsu living in Australia and are known within the Taisha-ryu as :Goshu (Australia) Hyoho (military tactics) Taisha-ryu Kenjutsu Keikokai (study group). Our study group located in Sydney is one of six study groups authorised to practice Taisha-ryu outside of the main dojo which is located in Yatsushiro, Kumamoto, Japan – there are two in Europe and three in Japan; One in Tokyo, another in Kagoshima and the third in Saga. Anyone not a local Kyushu resident able to attend the weekly training in Yatsushiro wishing to begin to study and practice Taisha-ryu kenjustu must apply to be instructed, and possibly be accepted into the school personally by Yamamoto-sensei, Uehara-soke or Tazoe-sensei at one of the study groups when an open seminar is held. This blog has been created for the members of Taisha-ryu and anyone else interested in koryu Kenjutsu. In the above photo: Grading in Yatsushiro, March, 23, 2014 – I’m in the back row as I was the newest member at the time. (Click to enlarge). Hello, where (suburb) in Sydney do you currently train?